Oh, that‘s cool and I willingly believe that it is great fun to create such things. „Treat“ is my favorite and I think there is even some King Crimson shining through. This looks like a really huge attainment, congratulations! These Rubik‘s-like puzzles are much too hard for me and they take far too much time. Did someone eat it in the meantime? Is there a trick to trim all edges to the same length? This is stellation no. 14. I think I'll finish it next year. 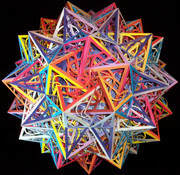 This is one of my favourite uniform polyhedra and I like your model very much. 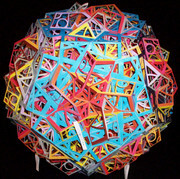 I once made this shape too but only with three colours. That‘s not really satisfying. Ah, thanks! I tried ~6 but that could not work, as I know now.